When Donald Trump places his hand on the Bible and swears the oath of office on January 20— a concept I’m having trouble wrapping my mind around— most people in the country and around the world will be reeling with disgust. And that’s just going to be the beginning. Trump will command the attention of the public and the media for the next four years. His racist bombast and willingness to say whatever’s on his mind has been an international story for over 18 months already. But Trump has seemed unenthused about governing the country in the week since his stunning upset victory over Hillary Clinton. The president-elect has expressed interest in spending as little time in the corridors as possible, The New York Times reported on Friday. Mr. Trump’s advisers hold out the possibility that the president-elect may spend more time in the White House as he grows less overwhelmed and more comfortable in the job. All signs point to the fact that Trump will be tangentially involved in the nuts and bolts work of the office. Instead it appears the work will be done by his Cabinet. And given the three selections so far, that’s something that should fill the majority of the nation with dread. Incoming Vice President Mike Pence’s political views are well known. Trump’s first hire, back in July, was in Congress for 12 years before becoming Governor of Indiana in 2012. All signs point to a Pence dominated Trump White House in the days since the election, as Pence took over the Trump transition team on Friday, supplanting McDonald’s-fetching toady Chris Christie. And Pence is poised for more power. Recall the leaked offer to John Kasich from Trump after the primary. Trump reportedly backchanneled an offer to Kasich via his son Donald Jr. to be the most powerful Vice-President in history. Kasich would have total authority and control over foreign and domestic policy, Junior said. Trump would be in charge of making America great again. Kasich turned down the job, and Pence took it. And that means that Pence’s views on social issues— like his well established record of homophobic positions, including his affection for gay conversion therapy— will have an influence on the White House’s course going forward. Jeff Sharlet, author of, most recently, Radiant Truths: Essential Dispatches, Reports, Confessions, and Other Essays on American Belief, told Amy Goodman on Democracy Now! in July that Pence is not a new example of Christian supremacist hate, just a smoother one. While Pence’s Christian conservatism is justifiably horrifying on social issues, its affects on his economic views are also cause for concern. As Jeremy Scahill points out over at The Intercept, Pence’s views on economics and the Bible are not exclusive. In fact, for Pence and others like him, capitalism is a heaven-delivered market. In July, Shalet said that Pence’s belief system sees the struggle between free markets and social safety nets as a theological struggle. It’s a belief system he shares with one of Trump’s two equally powerful appointees from Monday. The new White House Senior Strategist is Trump campaign head Stephen Bannon. Bannon is best known for maintaining the white supremacist website Breitbart, a fetid vernal pool of vile anti-Semitism and racial, homophobic, transphobic, misgoynistic hate. His appointment was celebrated by Stormfront. All this ground has been well covered by most major media outlets over the past week. This week, Buzzfeed reported that in a recently unearthed tape from the summer of 2014, Bannon made clear he shares Pence’s veneration of capitalism and loathing of secularism. And his views are, if possible, more unhinged than the Vice-President’s— and, given his proximity to Trump, more dangerous for the world. 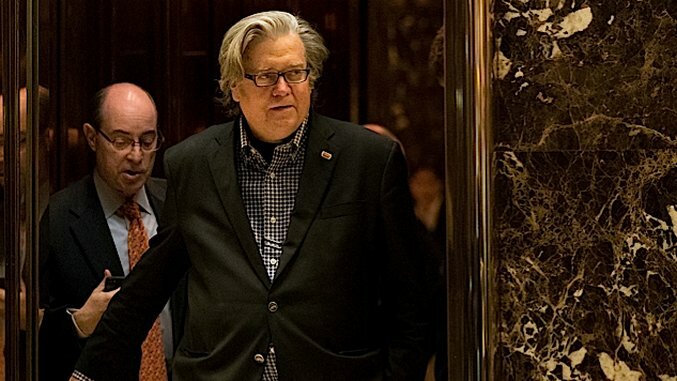 During the talk, Bannon takes issue with what he sees as two forms of capitalism that have their roots in the rejection of “Judeo-Christian values.” On the one hand, he decries the “crony-capitalism” of dictatorial regimes that concentrate wealth to a small group of people; on the other hand he rails against the Ayn Rand style of objectivist libertarianism. Both of these visions of capitalism, says Bannon, are based in their adherents’ embrace of a secularist ideal that sets aside the good of the people for the pursuit of profit. This is clear— Bannon sees the future of the world as a conflict between the Judeo-Christian West and the savage hordes of secularism and Islam; and sees capitalism as a subordinate, but important, part of that fight. In fact, to take his remarks at face value we can theorize that for Bannon, everything in the world is second to the clash of civilizations. That’s a terrifying voice in the President’s ear— and it’s not being moderated by the “safe choice” for Chief of Staff. Priebus is a less obvious ideologue than Pence and Bannon, but he’s equally dangerous. The new Chief of Staff is a long time management type in party politics. He became the Wisconsin GOP chair in 2007 and only three years later saw Scott Walker ascend to the governorship amidst a national Republican wave. Mere months later, in January 2011, he became the RNC chair. Over Priebus’ tenure, the party has tilted farther and farther to the fringe of conservatism, served up a pool of bumbling lunatics for an actual white supremacist to walk all over on his way to the presidency, and left Washington in six years of gridlock. But he knows how to talk to the Republican establishment. It’s that last part that should cause terror. The GOP establishment has shifted so far to the right that it’s only by comparison to the literal ghouls in the Trump transition team/possible cabinet that the likes of Paul Ryan, the Speaker for the House of Representatives, seem normal. And Ryan, who is friends with Priebus, aims to have an outsized influence in creating domestic policy for the Trump administration. That’s bad on a number of levels. Ryan’s policy proposals for the country include phasing out Medicare completely by 2017 as part of an absolute death blow assault on the social safety net and essentially eliminating taxes on the rich, regulations on businesses, and worker protections. Those are the interests that Priebus wants to protect. These are the three first “hires” of Trump’s presidency. The list of potential appointees for the rest of the cabinet is equally distressing. Let’s hope that the incoming administration is incapable of doing anything. At all.